We rode 40 miles, half a mile for each year of Jack's life, to celebrate his eightieth birthday. Jack was 80 the day before the ride. He started our Thursday rides during the 1990's - so a fitting tribute to Jack's energy and enthusiasm. Jack had hoped to join us and had his electric bike all charged and ready to go but had to pull-out. 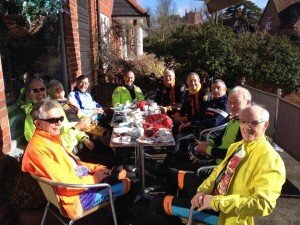 Nevertheless, a group of 11 riders enjoyed the February sunshine for coffee at the Bakery, Old Basing and lunch at the Sun Inn, Bentworth where we met friends from the Hampshire Cycling Fellowship.